Due to the extreme destruction hurricane Maria has caused the island of Puerto Rico, the team was unable to get a flight to help with humanitarian efforts. Therefore, we have taken a detour to Cooper City, FL, after spending an extra week having sessions at our home church, The Bridge in Cleveland, GA. Our host, Pastor Kevin Harris, has explained that The Keys were devastated by Hurricane Irma and today, they are still trying to clean up debris, and trying to reconstruct what little is left of the communities. This week, we have been hard at work alongside the Cooper City Church of God, providing support with painting, cleaning, organizing, and even making a stop to The Keys in order to provide help to families tragically affected by hurricane Irma We’ve seen a great deal of pain. Many have lost valuable items that no amount of money can replace. 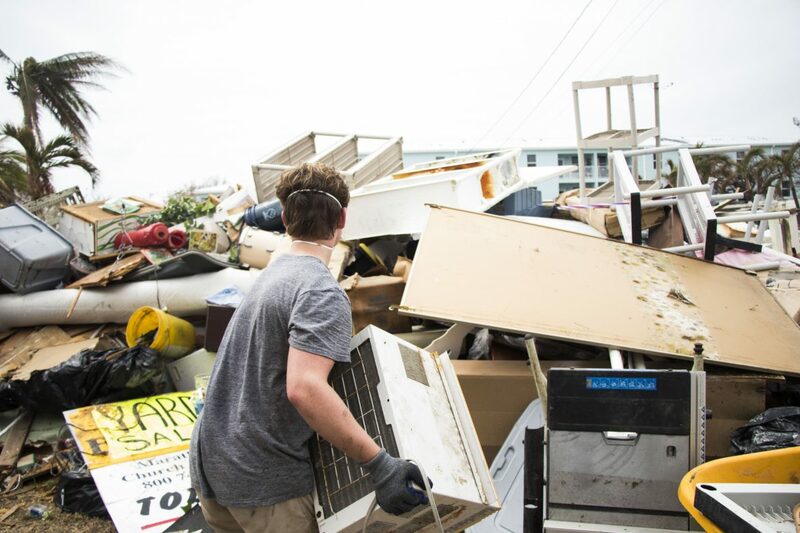 While cleaning out a trailer home in Marathon, FL, we were forced to trash a sizable number of items that may mean nothing to you and me, but everything to someone else. Something like a toy car is not valuable because of its price tag, but because of the memories you have of your little boy playing with it. This was the very real experience Miss Meghan, the pastor’s wife of Marathon Church of God, had to endure. Another gentleman, by the nickname of Captain, was in the middle of having to drive several trips to the hospital to visit his dying wife, all while his home had been flooded and emptied. All of the belongings he and his wife had left fit in a small pile on top of the dining table. The team spent hours discarding furniture, clothes, illegible paperwork, and many other things that were left unrecognizable. His story left us with our hearts broken, but motivated to help all the more. We do understand that only God can bring peace during these most difficult times. We encourage ourselves in the Lord, knowing that we can do all things through Christ who gives us strength. There are physical and emotional hurricanes many people had to withstand, and their pain is deep but their hope is bottomless. As we witness stories like these, we are reassured that we are exactly where God wants us. Our detour was no accident.